Windows keep history of document we open which can accessed by clicking Start > Documents. We already know the boring and long 5+ clicks procedure to clear this recent document list. 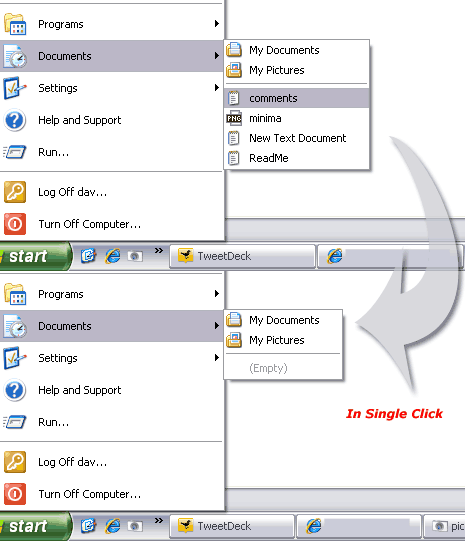 Now you can save lot of clicks and time by using quick shortcut to clear recent document list using “Blast Documents”. 1. Download Blast Documents. It is very small, just 599KB. 2. Install Blast Documents app on the computer. 4. Drag the Blast Documents iconon taskbar or quick launch. Then click the Blast Documents icon to clear recent document list in single shot. Blast Documents is a simple and very useful utility to clear recent document list which otherwise take lot of clicks, efforts and patience to clear – all the time!